Earth (1930), directed by Alexander Dovzhenko. Warning: Spoilers may follow for Earth. Eisenstein and Tarkovsky. The two names film adepts will most likely utter when asked about film directors of the Soviet Union era. Both names represent artistically successful periods in Soviet cinema’s history, different though they may be. An era of theoretical experiments on propagandist content in the 20s, versus an era of more poetic films from the late 50s till the 70s, often subversive on aspects of Soviet society. The period between those eras seem like a gap, a severe winter in which Stalin supressed film industry, resulting in a very limited output. Both ages seem therefore almost to stand on its own, hardly connected by a gradual evolution. 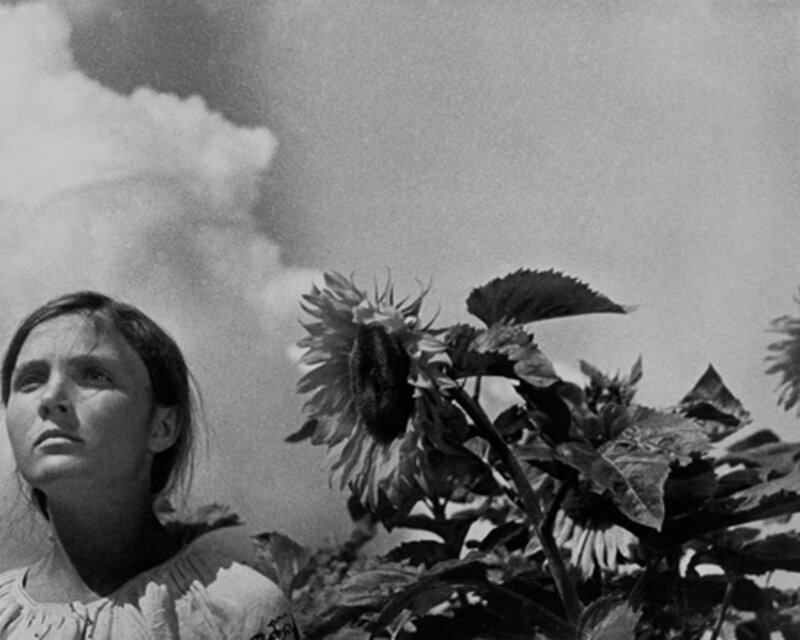 It is therefore remarkable that the first golden age of Soviet cinema is ended by a great film that in fact points to the poetic qualities of the second golden age: Earth (Zemlya, 1930) by Alexander Dovzhenko. The political situation of the moment is often strongly reflected in Soviet cinema throughout the decades. More so than in any other of the great film countries. In later ages, this often resulted in films by directors that searched to cross borders set by the totalitarian regime. This was less the case with the cinema of the 20s. Communist ideas found their way quite unanimously in films of directors such as Eisenstein, Pudovkin and Dovzhenko. Earth seems to follow the pattern of a lot of those films from the 20s. This was a decade of hope of a bright future, not yet overshadowed by the fear of Stalin’s suppression. This spirit of hope and enthusiasm, shared by directors, would often find its way in a support of the communist ideals in their films. Their enthusiasm for theoretical film experiments was at least as great, but less supported by the Soviet Communist Party. The resulting films proved too sophisticated for the people, being therefore less adequate for propagandist purposes. This was especially the case with Earth, that was even rejected by the Party. Actually, the man in the street was not so interested in the theoretical exercises of the great masters. These films remained a relatively small part in the range of films on offer, which was, similar with the West, dominated by light entertainment. Yet these films proved to be an effective way to export the Communist ideas to the West. They were received with much interest, if not for the Marxist ideas, then certainly for the technical innovations. Such as Eisenstein’s ‘montage of attractions’, where a precisely ordered sequence of images aimed to stir a reaction by the spectator. 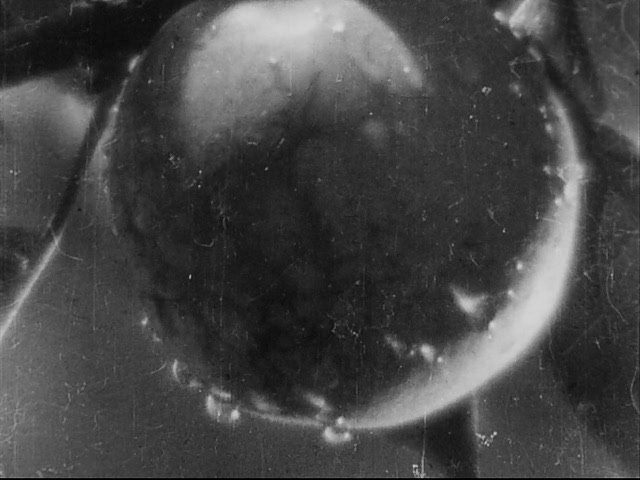 Dziga Vertov explored with his ‘kinoglaz’ the ways in which the camera could register reality. At first sight, Dovzhenko might seem less dogmatic than these directors. But he just as well developed a signature style, that may be just as influential on later generations of directors. Montage was of much import for the Ukrainian director, but he did not use this in a narrative way. The connection between the images is much more loaded with symbolism, instead of the manipulation of the spectator that Eisenstein aimed for. Eisenstein, or Pudovkin, would never start a film with a death bed scene of ten minutes, that add little to the rest of the film, neither narratively nor ideologically. 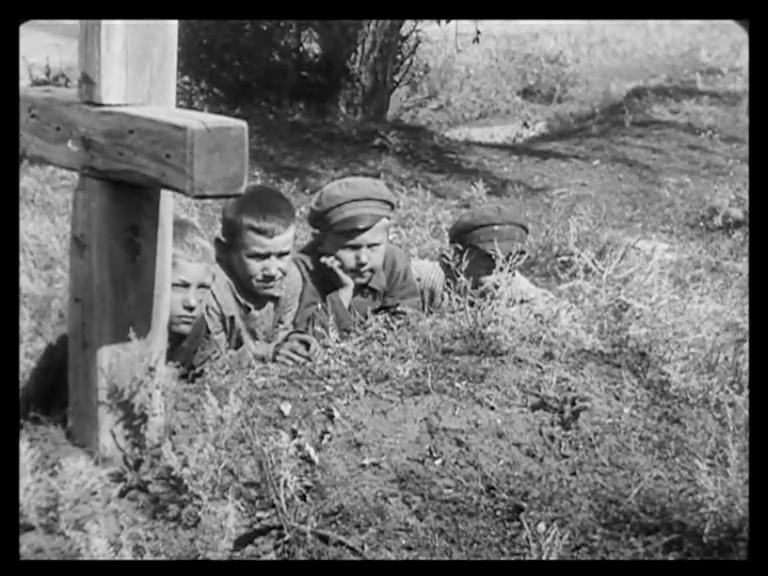 Dovzhenko does so with Earth, alternating images of the dying old man, children playing, ripe fruit and waving grain. Earth is an appeal for collectivization, a large project in which the state expropriated land from the farmers, in order to make way for an efficient, joint agriculture. This project started in the late 20s. At the time when Dovzhenko finished his film though, collectivization had already been deteriorated in a clash between the state and the farmers, resulting in a shortage of food. To poverty stricken farmers at the time, Earth must have seemed like a denial of the harsh reality. The basic plot concerns the entrance of a tractor in an underdeveloped village, modernising the way agriculture is handled. This simple tale of progress fitted with the need for optimistic films about collectivization. Dovzhenko ignored the social reality, and inserted musings on the cycle of life and death, the passing of generations and the relation between men and nature. These musings never become very concrete, just like poetry never does. The symbolism is in large part aimed at the ‘birth’ of communism, within an endless cycle of life and death. The context is that of nature, hence the many references to nature’s cycle of life and death, instead of the Marxist ideology. This proved to be way too mystic; no wonder the Party was less than enthusiastic about the abstract quality of Earth’s visuals. Dovzhenko’s style makes it clear that he is not so interested in reality. He once stated that between beauty and truth, he would rather choose the first. Cinematic rules to benefit a sense of realism, are often ignored. There are for example a lot of close-ups, but hardly any establishing shots, thereby creating a slight sense of disorientation. In the opening scene mentioned before, we witness three generations at the deathbed of an old farmer. That is at least the presumption of the spectator, because you never see these characters in one frame. The connection is made exclusively by montage. The consecutive images of the various characters give an impression you have seen them together, responding on each other. But in reality you have never witnessed them together. Within the logic of this montage, you will connect the images of the crying women with the dying of the farmer, but one will find out he is put off the scent. Nowadays, a cinephile may be more attracted by the warm, lyrical feeling of Earth, than the flag waving rhetoric of the Eisenstein school. Dovzhenko celebrated nature, and men’s place in it, in a way that was seldom to be seen in its time. His handling of this somewhat mystical theme, bears parallels with films such as Tarkovsky’s. Tarkovsky would of course take this to a more spiritual level, which continue to appeal to new generations of film enthusiasts. The seed however might have been planted decades ago by Dovzhenko.